Optimizing business performance for construction companies can be an overwhelming job. Enhancing performance requires careful planning and efficient production to fill orders for time-sensitive construction projects. Increased efficiency in every department from purchasing, to warehouse management to sales and finance is required to meet the growing demands of clients in the construction industry. 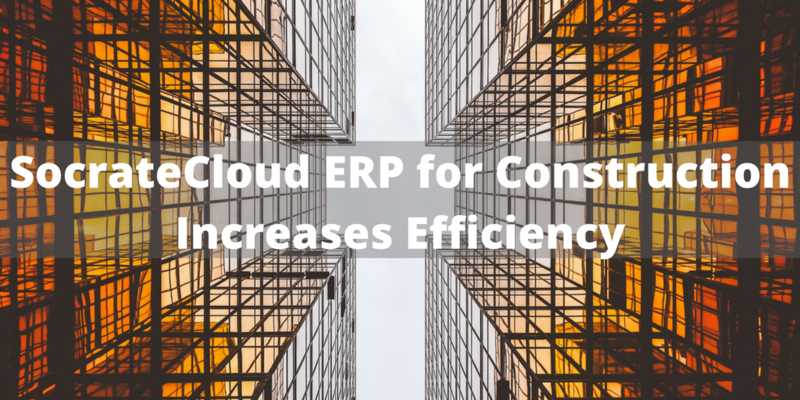 Below is a summary of the primary responsibilities facing manufacturing companies and the ways that SocrateCloud ERP for construction increases efficiency for construction projects. Responding to the needs of construction companies calls for a solution that will optimize their production capacity and plant the seeds for future growth. Providing global oversight of project execution: Component precision depends upon the functionality of all departments within a manufacturing company. Many manufacturers struggle because they do not have access to a real-time overview of key department indicators. Improving budgeting and cash flow: Budgeting can be a challenge to companies that lack the algorithms necessary to help you optimize your stock turnover. Streamlining purchasing activities: Purchasing is critical to maintaining a healthy bottom line. Purchasing agents often have difficulty forecasting buying needs due to a lack of real-time access to sales patterns and current inventory. Optimizing warehouse operations: Many manufacturers struggle to optimize their warehouse operations because they have not successfully automated key processes. Management of project equipment and tools: Tracking the costs and depreciation associated with production equipment is often neglected by manufacturers. However, equipment management is more important than ever due to growing safety regulations. Improving sales management: Construction companies expect to receive requested quotations quickly. Completion of accurate quotes is a challenge for some steel component manufacturers due to a lack of access to real-time inventory. Meeting finance and accounting goals: Maintaining an impressive P&L statement is not easy for companies that are unable to quickly analyze sales results and profit margins.